MOCAP Extra Wide Flange Tapered Plastic Plug Caps are inexpensive dual function closures which can be used as either a plug or a cap. 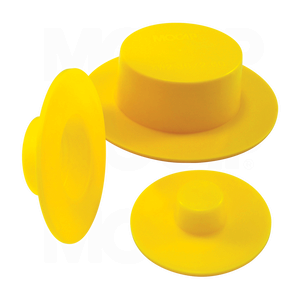 These tapered polyethylene plug caps are made from tough but flexible polyethylene to form a secure fit, yet are easily removed. These Plastic Plugs feature flanges which are thicker and wider than any of our other plug-cap series. Over-sized flanges and the high-visibility colour require removal before assembly operations. Many Sizes of Our Thick Extra Wide Flange Tapered Plug Caps are Stocked for Immediate Shipment. MOCAP Plug Caps can also be used as inexpensive, single use disposable masking caps or masking plugs for painting, coating and spraying processes up to 79°C (175°F).